Robotic rehabilitation systems for upper limbs have been developed as two system types: active or passive. Active-type systems use actuators to provide users with varying degrees of force; in contrast, the force available from passive-type systems is limited, although these systems are safer to use. In this paper, a passive-type force display with redundant brakes is proposed to extend the displayable force region of the system. The kinematics and statics are derived, and the reaction force generated by brake torques is clarified. The displayable force region is analyzed in the simulation, and then the experiments are examined to verify the proposed analytical model. 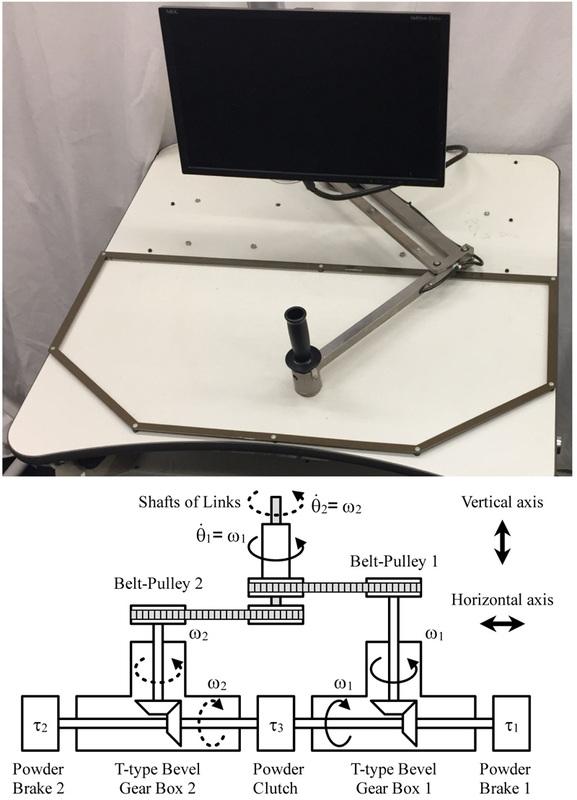 N. Takesue, J. Furusho, S. Mochizuki, and T. Watanabe, “Analysis of Displayable Force Region at Passive-Type Force Display with Redundant Brakes – Development of Rehabilitation System for Upper Limbs mboxPLEMO-Y (Redundant) –,” J. Robot. Mechatron., Vol.30, No.6, pp. 880-891, 2018. S. L. Wolf et al., “Retention of upper limb function in stroke survivor who have received constraint-induce movement therapy: the EXCITE randomised trial,” Lancet Neurol., Vol.7, No.1, pp. 33-40, doi: 10.1016/S1474-4422(07)70294-6, 2008. A. W. Dromerick, D. F. Edwards, and M. Hahn, “Does the application of constraint-induced movement therapy during acute rehabilitation reduce arm impairment after ischemic stroke?,” Stroke, Vol.31, No.12, pp. 2984-2988, 2000. S. J. Page, P. Levine, and A. C. Leonard, “Modified constraint-induced therapy in acute stroke: a randomized controlled pilot study,” Neurorehabil. Neural Repair, Vol.19, No.1, pp. 27-32, doi: 10.1177/1545968304272701, 2005. M. R. El-Helow et al., “Efficacy of modified constraint-induced movement therapy in acute stroke,” Eur. J. Phys. Rehabil. Med., Vol.51, No.4, pp. 371-379, 2015. K. C. Lin, C. Y. Wu, T. H. Wei, C. Gung, C. Y. Lee, and J. S. Liu, “Effects of modified constraint-induced movement therapy on reach-to-grasp movements and functional performance after chronic stroke: a randomized controlled study,” Clin. Rehabil., Vol.21, No.12, pp. 1075-1086, doi: 10.1177/0269215507079843, 2007. A. Sterr, T. Elbert, I. Berthold, S. Kø lbel, B. Rockstroh, and E. Taub, “Longer versus shorter daily constraint-induced movement therapy of chronic hemiparesis: an exploratory study,” Arch. Phys. Med. Rehabil., Vol.83, No.10, pp. 1374-1377, 2002. H. I. Krebs et al., “Overview of clinical trials with MIT-MANUS: a robot-aided neuro-rehabilitation facility,” Technology and Health Care, Vol.7, No.6, pp. 419-423, 1999. H. I. Krebs et al., “A Paradigm Shift for Rehabilitation Robotics: Therapeutic Robots Enhance Clinician Productivity in Facilitating Patient Recovery,” IEEE Engineering in Medicine and Biology Magazine, Vol.27, No.4, pp. 61-70, doi: 10.1109/MEMB.2008.919498, 2008. G. Rosati, M. Andreolli, and A. Biondi, “Performance of cable suspended robots for upper limb rehabilitation,” Proc. IEEE Int. Conf. on Rehabil. Robotics, 9847688, 2007. I. Treger, S. Faran, and H. I. Ring, “Robot-assisted therapy for neuromuscular training of sub-acute stroke patients, a feasibility study,” Eur. J. Phys. Rehabil. Med., Vol.44, No.4, pp. 431-435, 2008. S. Hesse, H. Schmidt, C. Werner, and A. Bardeleben, “Upper and lower extremity robotic devices for rehabilitation and for studying motor control,” Curr. Opin. Neurol., Vol.16, No.6, pp. 705-710, doi: 10.1097/01.wco.0000102630.16692.38, 2003. S. M. Waller, W. Liu, and J. Whitall, “Temporal and spatial control following bilateral versus unilateral training,” Hum. Mov. Sci., Vol.27, No.5, pp. 749-758, doi: 10.1016/j.humov.2008.03.006, 2008. J. Furusho and T. Kikuchi, “Applications of robot technology to rehabilitation system for upper/lower limbs,” Sogo Rehabil., Vol.35, No.5, pp. 439-445, 2007 (in Japanese). J. Furusho, “Rehabilitation Robots for Upper Limb and Their Practical Applications,” Sogo Rehabil., Vol.38, No.12, p. 1117, 2010 (in Japanese). J. Furusho et al., “Development of 3-D Rehabilitation System for Upper Limb (1st Report: Development of Mechanism including ER Actuators and Whole System),” J. Robotics Society of Japan, Vol.23, No.5, pp. 629-636, doi: 10.7210/jrsj.23.629, 2005 (in Japanese). K. Miyakoshi, K. Domen, T. Koyama, J. Furusho, and K. Koyanagi, “The Effect of Robot-aided Training on Motor Recovery following Stroke,” Japanese J. of Rehabil. Medicine, Vol.43, No.6, pp. 347-352, doi: 10.2490/jjrm1963.43.347, 2006 (in Japanese). J. Furusho and N. Takesue, “Research and Development of Functional Fluid Mechatronics, Rehabilitation Systems, and Mechatronics of Flexible Drive Systems,” J. Robot. Mechatron., Vol.28, No.1, pp. 5-16, doi: 10.20965/jrm.2016.p0005, 2016. J. Furusho and M. Haraguchi, “Development of Rehabilitation Systems for the Limbs Using Functional Fluids,” J. Robot. Mechatron., Vol.26, No.3, pp. 302-309, doi: 10.20965/jrm.2014.p0302, 2014. J. Furusho and H. Ikeda, “Rehabilitation, Nursing Care and Mechatronics,” J. Japan Society of Mechanical Engineers, Vol.119, No.1166, pp. 4-7, doi: 10.1299/jsmemag.119.1166_4, 2016 (in Japanese). J. Furusho et al., “Non-Wearing Type Rehabilitation Systems for Upper Extremities,” J. Japan Society of Mechanical Engineers, Vol.119, No.1166, pp. 19-21, doi: 10.1299/jsmemag.119.1166_19, 2016 (in Japanese). J. Furusho et al., “Research and Development of Quasi-3D Rehabilitation System for Upper Limbs PLEMO-P3,” Japanese J. of Rehabil. Medicine, Vol.46, 1-4-21, 2009 (in Japanese). T. Ozawa, J. Furusho et al., “Development of Rehabilitation System for Upper Limbs PLEMO-P3 System for Hemiplegic Subject (Motor Function Test for Assessment and Training, and Research for Development of Practical Type),” Trans. Japan Society of Mechanical Engineers, Ser.C, Vol.76, No.762, pp. 323-330, doi: 10.1299/kikaic.76.323, 2010 (in Japanese). J. Furusho et al., “Development of the Passive-Type Force Display System “Neo-PLEMO”, Which Can Display the Opposite Resistance Force against Handle on the Arbitrary Link Posture” Trans. Japan Society of Mechanical Engineers, Ser.C, Vol.78, No.786, pp. 535-546, doi: 10.1299/kikaic.78.535, 2012 (in Japanese). M. Haraguchi and J. Furusho, “Basic Research of “MR-PLEMO”: 2-D Passive-Type Rehabilitation System for Upper Limbs Using MR Fluid Brake,” J. Robot. Mechatron., Vol.24, No.5, pp. 743-753, doi: 10.20965/jrm.2012.p0743, 2012. T. Ozawa, J. Furusho et al., “Development of Rehabilitation System for Upper Limbs: PLEMO-P3 System for Hemiplegic Subject (Motor Function Test for Assessment and Training, and Research for Development of Practical Type),” J. Robot. Mechatron., Vol.25, No.1, pp. 136-144, doi: 10.20965/jrm.2013.p0136, 2013. J. Furusho et al., “Improvement of Upper Limbs Rehabilitation System PLEMO-Y (Kaken),” Proc. JSME Annual Conf. on Robotics and Mechatronics, 2A1-01b2, doi: 10.1299/jsmermd.2016.2A1-01b2, 2016 (in Japanese). A. R. Fugl-Meyer et al., “The Post-Stroke Hemiplegic Patient: A Method of Evaluation of Physical Performance,” Scand. J. Rehabil. Med., Vol.7, No.1, pp. 13-31, 1975. H. Davis and W. Book, “Torque Control of a Redundantly Actuated Passive Manipulator,” Proc. American Control Conf., pp. 959-963, doi: 10.1109/ACC.1997.609669, 1997. J. Furusho et al., “Force Display System Using Redundantly Couples of Functional Fluid Brakes,” Proc. JSME Annual Conf. on Robotics and Mechatronics, 1P1-2F-E4, doi: 10.1299/jsmermd.2003.49_2, 2003 (in Japanese). K. Koyanagi, J. Furusho, and L. C. Dongn, “Development of a Passive Type Force Display System with Redundant Couple of Brakes,” J. Robotics Society of Japan, Vol.23, No.4, pp. 488-495, doi: 10.7210/jrsj.23.488, 2005 (in Japanese). J. Furusho et al., “A Performance Evaluation Method of a Passive-Type Force Display and Rehabilitation System with Redundant Brakes,” Proc. IEEE Int. Conf. on Rehabil. Robotics, pp. 950-955, doi: 10.1109/ICORR.2009.5209504, 2009. M. Haraguchi, Y. Jin, and J. Furusho, “Basic Research of 2-D Rehabilitation System for Upper Limbs with Redundant ER Brakes (1st Report, Analysis of Its Force Display Ability),” Trans. Japan Society of Mechanical Engineers, Ser.C, Vol.76, No.761, pp. 142-150, doi: 10.1299/kikaic.76.142, 2010 (in Japanese).